The introduction of a national eleven plus would require some schools to rethink their curriculum as well as their attitude to their bright children and their parents. Naturally there could be a `little uproar’ from some teachers who would oppose selection. Other teachers may feel that the time spent on preparing top groups for the eleven plus would be better spent on other educational activities. One way of gaining almost universal approval would be to re-introduce the system that worked happily for many years in England. This was called: “Payment by Results.” The better the teacher taught the better the results and the better the pay envelope at the end of the month. If such a system was introduced the professional culture of the primary school would need to be strengthened. An additional layer of administration and planning would need to be introduced. Teachers would need to continue to share judgement about children and draw on expertise from others. Naturally help for the very able preparing for the eleven plus would not take the place of the present Standard Assessment Tasks. It may simply add another level. The new level may, however, end up with the understanding that it not the teachers who are being paid extra for a different type of teaching but the children who are being challenged, enriched and extended. The eleven plus is full of technical jargon. Some jargon is necessary because otherwise everything that we read and hear would sound like platitudes. The general public, approaching the eleven plus for the first time, have to learn the significance of terms like `verbal reasoning’. Even these two simple words `verbal’ and `reasoning’ have to be understood, dissected and studied. A clinical psychologist may well explain `verbal reasoning’ in a different manner to an educational psychologist. An eleven plus teacher may discuss `verbal reasoning’ using a different vocabulary to a class teacher. The mother of a successful eleven plus candidate may interpret `verbal reasoning’ differently to a mother in the process of investigating the eleven plus. The technical language that could be used when defining verbal reasoning – along with the arbitrary definitions – may sometimes appear to unnecessary complex. Yet expertise – whether it be from a head teacher, an examiner or a parent at the school gate – may need to be redefined to allow mutual comprehension. We take for granted that the `expert’ setting the examination knows and understands the present needs of the local grammar school. There is also a need to have faith in the local eleven plus teachers who have had successful candidates in the past. We all hope that up to date `modern’ research has been applied to the present eleven plus tests to make sure the intellectual premises the tests are based on are still valid for today’s contemporary eleven plus children. My anxiety is that the eleven plus is such a defining examination that those responsible should be accountable. If we ask an `expert’ for information or an opinion we need to have confidence in the veracity of what we are told. How we interpret what we hear is up to us – but we do need to feel confident about the sources. Perhaps the most important and subtle factor influencing an eleven plus child is his or her valuation of personal self esteem. The factor of self esteem will affect an eleven plus child at school, in lessons, at home, with peers, siblings and especially parents. Many bright and able children do have a competitive streak where success gives pleasure. Approval from others is vital to a child’s well being. Failure can lead to feelings of misery and despair. An eleven plus teacher, be it an outside person or a member of the family, will need to maintain discipline, teach effectively and above all communicate. We all know just how hard it is to communicate when nothing seems to be coming back. Verbal approval then becomes as essential as breathing. On our eleven plus courses we often see children responding to their peers – even though the other children may have come from different schools, home environments and even have different eleven plus aspirations. Your first born has passed the eleven plus and will be going to grammar school in September. The first born can play the piano to Grade 5, the violin to Grade 3, sings in the school choir and swims regularly with a swimming club. Your first born spoke early, read early and is a happy and contented child. Grammar school is going to be a good option. The grammar school in question has a thriving drama club – and this is where your child’s heart lies. The second born is a little more laid back – a little less driven and clearly very different. The third born is the sweetheart of the family. Loved by all – with a lovely smile and a pleasant personality. Communicative and happy. No problems there. Back again to number two. As a parent you would not want to change your second in any way – except possibly wish to clone the work habits of number one. Cloning is a method of producing perfect living copies of plants or animals, by transplanting a cell nucleus into an embryonic environment. It is likely that you have been practising this form of cloning for ages by taking cuttings from one plant to establish another. Cells of animals and humans contain the same genetic information – so it should be possible to take one `cutting’ and nurture a duplicate. Recent advances in DNA should allow scientists to be able to identify the study gene. Once this has been established in your first born you should be able to organise a `cutting’ and thus establish the perfect eleven plus candidate. In built in the new style second born will be a desire to work through paper after paper without grumbling. There will also be a compulsion to maintain a tidy bedroom and place washing in the washing box without a reminder. Your friends will remark on your good fortune. Your child’s teachers will tell you how proud you must be of your child’s successes and progress. Your in-laws will remind you, once again, that your spouse was also fantastic academically. You will be able to rest at night confident about the eleven plus. You will be able to say: “We did it without much outside help – just natural ability.” There will be no need to tell anyone at all that all you did was a little DIY cloning. A great majority of parents think that they know the best way of bringing up their own children. When they look at other eleven plus children, and their parents, they can see where others have gone wrong. Is the other family engaged in studying the wrong eleven plus papers, or selecting the wrong time of day to do the study or even contemplating the wrong school? Ask a group of eleven plus parents about why they want their children to go to grammar school. Today millions of people have been filling in their census forms. The census is used to determine future needs and trends. A simple question about the eleven plus may have been able to offer fruitful information that could have been used by local authorities, schools and pressure groups all over the country. One question could have opened up a national debate that may have had far reaching significance on the nature and extent of education in the years ahead. Parents chatting in the playground can’t change the world – but they can become significant force in any discussions about pressures and priorities. A nation wide eleven plus will not be a universal panacea to the present ills of today’s education system but a few more children may benefit from the perceived mores and traditions of an established grammar school education. In the past the admonition, “Man know thyself” was most often attributed to philosophers and theologians. We may need to look back to Socrates for an interpretation of what he meant – but it is possible that his thoughts would be afforded short shrift by many today. Like most things associated with Socrates, however, the phrase `Man know thyself’ was possibly to do with wisdom. Over the last fifty years technological advances have opened up discussions of the value and nature of tests to far more than to those studying psychology, sociology or education. The eleven plus, for example, is supposed to give valid results – but the tests are only revealing certain aspects of a child’s intellectual make up. An ability test, for example, can not tell us all about a child’s make up. The eleven plus tests are used to grade children into levels of ability. The same tests can not describe how likely a child is to be an academic or an entrepreneur. The tests can not tell us about a child’s personality. A grammar school, for example, may achieve excellent `A’ level results based on selecting children who can pass tests. The same school may miss out on a few children who could bring a wealth of different attitudes to work and to study. All the eleven plus tests can do, in their present form, is give us information about a child at a certain point in time. The tests describe a child in terms of Standardised Scores and pass or fail. There is no place for any descriptive information. An eleven plus child can make a start on the journey to `Know thyself’ by being hard working, understanding of the needs of his or her parents and aware that interaction with teachers at school and all concerned at home is essential. A number of children working towards the eleven plus must be doing so because they are drawn to fearing failure. Security and reassurance must be pretty high on the agenda of most eleven plus children. We may expect many eleven plus children will `do their best’ when they are nurtured in a climate of consistent rewards. Children who can play chess at an early age are often recognised as being of a type of superior intelligence. Sadly the ability too play chess is not recognised by the current eleven plus examination boards – but we can live in hope. Imagine armies of children being taught to play chess – and then going onto to play against each other through the internet, chess foundations and classrooms. The children who won through the various rounds would be the children who would `go to grammar’. Parents would need to learn to play too – so instead of grappling with unending eleven plus papers parents could discuss various opening and closing gambits in the playground. Instead of informing the world that their child had reached standardised score of 132 – mums and dads would be able to talk about their child’s progress towards Grand Master status. In time the ingenuity and perseverance of the English teaching profession would turn its attention to producing books and papers about chess. Children would then be drilled in counters to the `Queen’s Pawn Opening Gambit’. Children would be able to say: “I got into grammar because I beat the Grand Masters from seven different countries.” The teachers and the tutors would be able to share in the glory. Instead of being able to say: “All my eleven plus children earned a place in a grammar school,” the tutors would be able to say: “I produced seven Grand Masters.” Sic transit Gloria! Elements of the eleven plus industry may even be tempted to replicate the work of Baron von Kempelen who was a mechanical genius who intrigued 18th Century Europe. He developed a chest that was 4 ft long, 2 ft wide and 3 ft high. In front of him was a chess board,- and he challenged all comers. Before the game started the Baron would open the chest’s compartment to reveal a bewildering array of levers, gears and cylinders. Hidden behind the machinery was a man manipulating the pieces through magnets attached to the base of the pieces. It would not take some parents to submit the view that ability in monopoly was a skill that would be more descriptive of ability. Scrabble and draughts could also be brought into the equation. This could lead to a super child who was able to play chess, win a scrabble – make millions through monopoly and learn to jump over others when playing draughts. Last year we had a number of children on an eleven plus course aimed at two highly competitive schools. A mother telephoned and followed the telephone call with an email. The mother was upset, rightly or wrongly, because I had sanctioned a series of five eleven plus verbal reasoning questions that would not appear in the eleven plus. The mother felt that we had wasted her daughter’s time. Her daughter had answered all of the prescribed questions correctly – but had made mistakes on three out of the five `unscheduled’ questions. A picture of an eleven plus child is emerging, the child should be able to play different types of board games, work through papers and cope with unexpected questions. Some grammar schools may enjoy looking at a slighter wider profile of their prospective pupils. Do we make eleven plus luck of does luck find us in an examination? We know from history that Charles 1st had a black cat – and he loved this cat very much. The cat died, unfortunately, but soon afterwards Charles was taken to be executed. Some say that the cat strolled under a ladder the day before he died! I come from Zimbabwe. This country was once called Rhodesia. I remember a story about a witch doctor who appeared in court back in 1949 who was accused of illegally practising his craft. The judge sentenced him and ordered that his spells and bones should be destroyed. The old man did not mind going to prison all that much – but he was mighty upset about the tools of his trade being destroyed and screamed that lions would return to Salisbury (now called Harare). We used to pass the spot in the car where the lions suddenly appeared just three weeks after the old man was sent to prison. In 1949 Salisbury was a sophisticated town and lions had not been seen in the streets for fifty years. As children we used to stop squabbling and peer out of the windows hoping to see the lions again. This was a whole pride of lions – the adult male and female and three almost fully grown cubs. I thought of the lions and the witch doctor because a black cat has taken to visiting us early in the mornings. I must confess that I am afraid to shoo him away – just in case! We do NOT have any ladders near our back door. The combination may prove just a step too far. After all Charles was beheaded after a final walk with his dog! Today a tall slim woman with long russet hair walked past our house leading a King Charles spaniel. Was this an omen? I have never seen the dog or the woman before. Where did they come from? Had they walked very far? The twenty first century is witnessing an explosion of scientific and technical knowledge – much of it underpinned by the advances in information technology. Children working towards the eleven plus are able to harness some of the advances through on line tests and lessons. Parents can benefit from the ability to communicate and learn about the eleven plus through various social media forms – such as forums, Twitter, Face book and text messages. Underpinning all this activity is the strength of the playground gossip. There can be no better form of communication that a group of parents discussing a topic in those few vital minutes before and after school starts. Whatever people learn and feel about the eleven plus it is possible that the surface has only been scratched when it come to understanding the complexity of the human brain. When we look at some of the questions that children are faced with it seems possible that some of the authors are still astonishingly ignorant of what actually constitutes ability. We talk about eleven plus ability in verbal reasoning. Is it honestly reduced to the ability to be able to follow a set of instructions? What about the children who grow frustrated by the drill of answering mundane questions? Surely some children should be offered the licence of being able to indulge in flights of fancy? This is not an argument of a posse of eleven plus day dreamers – this is plea on behalf of the gifted and talented children who want and need to be inspired and creative. Eleven plus children need to approach the examination with a degree of humility. They need to make steady progress and absorb key facts and sequences of operations. Eleven plus children need to reason and to think. Is all of reasoning reduced to: if GREAT MEANS XLYPZ what does LZPY mean? The final eleven plus result can be affected by emotion, anxiety and even, sometimes, panic. Eleven plus children will respond in many different ways to the pressure of the tests. If we go back to our school days some of our class mates who were always top of the class may not necessarily have been the adults who were eventually the most successful in later life. They may have been able to please the teacher and pass examinations but may not have been happy in their later life. Aristotle was wise and venerable man He lived long ago – long before the eleven plus was a twinkle in the eye of the educators of England. He cautioned us in his first book, Nichomachean Ethics that the mark of an educated man was that in every subject he looked for as much precision as its nature permitted. It may be apposite to feel that some parts of the eleven plus syllabus are not designed to ensure our bright and able eleven plus children enter the grammar school educated and willing to learn. Some areas of verbal and non verbal reasoning can be taught by rote and learnt by rote. They can also be executed by rote in the actual examination. In our lessons we sometimes work from book and papers from the major and well established publishers. The child looks at a new topic with amazement and confusion. An explanation is offered. There are smiles all around. The job is done. The topic has been mastered. Life goes on. There is no room for subjectivity, analysis and real deep contemplative thought. All that has happened is that the child has added another eleven plus notch. The papers from the major publishers somehow seem to expect children to be able to answer question after question in set times. There is no room for contemplating evidence. The child is judged by being able to answer a set number of questions in a set time. It can be argued that the role of the eleven plus is not to educate children but to find children who can cope with a grammar school education. Surely the role of the eleven plus should be to try to find educated children who would benefit from a grammar school education? The Eleven Plus seems to exist in some form of physical environment whose laws we all need to respect. We can not make up our own laws or even change the way the eleven plus operates. There is a kind of logic about the preparation for the examination the actual examination and the eventual aftermath. The logic we are looking at is the type of logic where; “you can not get two pints into a one pint pot”. This leaves us with the rather simplistic logic of the eleven plus. Perhaps a further example is needed. For generations men and women chess grandmasters have demonstrated the ability to play a hundred games of chess simultaneously. There are very complex interactions within the time zone of the eleven plus. Children have to be ready and willing to work. Parents need to plan and work sympathetically with their child and the examination providers have to set fair and `wholesome’ examinations. Underlying all of these emotions and pressures is the stress of the examination to parents and to children. Is there any logic in the fact that the eleven plus, by nature, engenders stress in families? The eleven plus is a unique event in the lives of families. Unique events can allow stress to blossom – but they can also defy logic. Every parent would like their child to pass and therefore challenge the laws of logic and earn a rightful place in a grammar school. If your child ever wonders about the eleven plus and why there is such a strong need to study and work hard you may care to look at the relationship of a Zen master to his acolytes. A Zen monk was once enjoying his contemplation, and yet was concerned about his progress. He wanted further instruction and approached his Master. “I have,” replied the monk. The secrets and mysteries of the eleven plus should become easier once your child has explained to you the significance of the exchange. During the eleven plus it is essential to blend reflection and activity. Your child should understand! William James, a philosopher (1842 – 1910) stated that `habit is the flywheel of society’. Did he mean, in eleven plus terms, that a habitual approach to a problem makes it harder to break the habit and come up with a fresh approach? Children on our eleven plus courses are often presented with questions designed to make them `think out of the box’. They are asked to measure a certain quantity of water. A Chinese rice farmer wants to water a section of his field. He has three containers, three litres, twenty one litres and one hundred litres. The stream that runs through his paddy field provides unlimited water. How does he measure one hundred litres? Fill the 127 litre container. Then fill the 3 litre container twice. This leaves the desired 100 litres in the biggest container. This provides us with a happy farmer, a well watered rice field and a neat solution. Some members of your family will offer the solution in a flash. Others will need to read and re-read the question hoping for a solution. Some may actually understand the question while others will simply guess and then argue that their answer is correct. If one of you recorded all the different attempts on the water question you may come up with a picture of how you, your spouse, your eleven plus child and any possible siblings approach the problem. You will naturally hope that your eleven plus child finds the neatest, the quickest and the most accurate solution. `Parentage is a very important profession; but no test of fitness for it is ever imposed in the interest of the children.” George Bernard Shaw (1856-1950). What would Mr. Shaw think of today’s eleven plus? Simply adding the words `eleven plus child’ gives rise to a whole slew of options. Parents have to strike a delicate balance between helping their child towards the examination and trying to make their child into someone different. The eleven plus adventure should be enjoyable. Praise, encouragement and approval will probably be more important than any censure. The needs of parents may not be the same as those of their children. Setting goals may help – but the goals need to be realistic. Parents need to recognise that they have to lift the pressure off - if their child is becoming unhappy and is not enjoying the experience. There is no test of fitness to be an eleven plus parent. The interests of the child are, however, paramount. What Price the Eleven Plus? To serve at the sign of the drum. And they call us the little piou-piou. The weary but cheery piou-piou. He was writing about the French Tommy who was also hurled into battle. In the end France was liberated at great cost. The French went their way with their own style of education and the English went theirs. France has adopted a form of education where children are expected to strive and work hard. The English, in some areas, have the Eleven Plus which seeks to find children who want to get into a grammar school. What would the men and women who died in such dreadful circumstance have thought about education today? Was it worth the sacrifice? I worked with a remarkably bright little girl today. She treated the team of teachers and teacher assistants around her with a clear glaze and a confident smile. I like to think that those warriors from the past would have been delighted to have met her. At the time of the Reformation controversialists wanted to reach as many people as possible – and so English was used to try to reach the masses. Any or all of the above words may have appeared at one time on an another on an eleven plus paper or specimen paper. Felix est rex quem omnes cives laudant. Fortunate is the king whom all citizens raise. “My child passed the eleven plus.” Many of us would relearn Latin if we could guarantee a statement of this nature! Would visits to museums be more interesting that working through eleven plus papers? Some eleven plus students may groan at the idea of a visit with the family to a museum. The same child would naturally cheer at the idea of a museum visit with the class. Some children would look at a visit to a museum as being akin to having yet more education stuffed into their minds. Others, however, may continue to relish the opportunity for stimulation and brushes with the past. On the way out do not linger by yet one more exhibit – say you are leaving. Find the museum shop. Spend money and leave. Do not suggest that your child should only purchase educational artefacts – allow freedom of choice. Remember your shopping taste, and that of your child, may not be the same. Simply acknowledge the perspicacity of your child, pay the bill and move on. There are many hundreds of museums. I can remember a fascinating visit to the Museum of Costume in the Assembly Rooms in Bath. The range of changing fashions was absorbing. Some children may be interested in the Museum of Childhood in Edinburgh with its collection of toys, games and costumes. The British Museum in London has the Egyptian mummy room. This room alone should quieten a rebellious ten year old. There are many wonderful museums in London with the Science Museum a family favourite along with the Horniman and the National Army Museum. The list goes on. Go with a strict budget. Museum shops are designed to stimulate and extend the mind. They are also set out in a way where money simply has to be spent. Education is not cheap. Before walking into the museum agree on a budget. Add the transport, the food and drink and all the incidental but necessary purchases and balance this against a free down load of an eleven plus paper and the prospect of thirty minutes of uninterrupted peace. Which activity will be likely to have the greatest impact on your candidate? Should your child be a little more cultured and involved with the past or just an eleven plus question cruncher? Being the parents of an eleven plus candidate may sometimes evoke similar emotions. Why Pass the Eleven Plus? “Please tell mum what you told me about the members of parliament. Money makes a difference for employees. As adults we can look at money for what it can buy – but also what it may seem to show about ourselves. We are told, for example, that if city bankers lost their bonuses they would all leave the city to work in more lucrative environments. If we were City Bankers, waiting for the bonus cheque, we possibly may have a different perspective on money to the rest of the world. For most of us the peripheral rewards of the prospect of a new luxury car have been crunched away in the present financial crisis. Greater brains than mine, however, have noted that pay is probably the single most important motivator used in today’s society. We are often told, however, that wages and salaries are not always essential to job satisfaction. If, however, wages are held to be inadequate then money becomes of vital importance. At what stage does working for money become important? At ten years old? A percentage of eleven plus children are offered pocket money. It is not hard to surmise that some children may be offered additional money in return for working hard and doing well in the eleven plus. We talk about a banker’s bonus in terms of millions of pounds. Offering a child a hundred pounds to pass the eleven plus may seem to be wildly extravagant and totally unnecessary – but if it helps to do its job should it be considered? A survey of eleven plus children – and the state of their pocket money – may give interesting information about how mercenary, or otherwise, eleven plus children are. Image a situation where eleven plus children could come together and discuss `The Eleven Plus and Collective Bargaining.’. The children would be able to compare what is happening in the different eleven plus areas. The `Eleven Plus Compare’ web site could collect important information. Natural leaders would emerge – developing into the `Eleven Plus Trade Association’. Children would be able to press for periodic wage surveys. Children could unite in saying that an Eleven Plus made up of mathematics and verbal reasoning was worth more than an eleven plus with only verbal reasoning being tested. Some fortunate children may also be able to state their views on the managerial efficiency of their parents. Is the pocket money paid by bank transfer into the `Eleven Plus Bank Account’? Do some children still need to remind their parents for their pocket money? Are some children still paid in cash – in a brown envelope? Do some parents think that an Eleven Plus bonus should be taxed? Should children work towards the eleven plus for the satisfaction of striving towards an idealistic goal – or can and should some parents be a little more materialistic? The spectre of the eleven plus examination may sometimes, but only sometimes, be used as an incentive to study. The incentive, however, does not lie in the actual eleven plus examination – but in the perceived prospect of actually writing and passing the eleven plus. Sadly for some children, and of course their parents, the eleven plus can be taken only once. A child can attempt a range of different eleven plus examinations – but the eleven plus is an examination written for a specific purpose. If parents try to use the eleven plus as an incentive – and the child passes - then the child’s attitude to future examinations may be affected. If the child, however, does not pass then the child may be, at times, motivated to want to give up and take life more easily. If the eleven plus was designed to become an incentive to study –it would not be an examination of ability and reasoning powers. Happily, however, for most of us involved in the examination we can work off much more attainable goals. “Let us finish the last two questions and we can all enjoy an ice cream.” This is, quite rightly, more of an enticement than an incentive. Most of us would rather be enticed than incentivised. The words: “Suddenly he saw the light” can be applied to a wide range of eleven plus adventures. Was there a sudden breakthrough in mathematics? Easy, she saw the light. Did he understand the verbal reasoning question? Naturally, he saw the light. Sherif, in 1935, did some experiments with the phenomenon of `autokinetic movement’. He put his subjects into a room where they were deprived of the normal frame points of reference – it was so dark that it was impossible to see the walls and the ceiling. A little tiny dot of light was presented. It was so dark that it appeared that the light started to move. If a person was placed in the same position on several occasions then it was obvious that the person started to anticipate the movement of the light – even though the light was not moving. The person saw the light moving about the same distance every time. In other words a frame of reference had been established. It would be amazingly easy to help your child with eleven plus work if all you had to do was place your child in a darkened room. You would then need to shine a little light onto a fixed spot. Your child may then see the light without all the bother of eleven plus tutors, books, on line tests, on line lessons and practice papers. This could change your life! You may need a few AA batteries – but think of the angst that would be saved! Some eleven plus children are able to make their own decisions comfortably and positively. Other children seem to prefer some form of committee meeting. There are committee meetings that are essentially formal in nature. The members of the committee raise issues, speak for and against proposals – but usually have to work within formal rules of engagement. There is often a chairman and a secretary. Their role is to try to help to direct the flow of the meeting. Sometimes there will be committee members who appear to have axes to grind. Some will be ready to jump on any infringement of the rules and regulations, of course it is the chairman’s role to manipulate the proceedings to prevent decisions that are not in `the common interest’ of the chairman! Show me any mother in the land who has not managed a family meeting. Some will see an eleven plus mother as a prime mover in harmonising proceedings. When the eleven plus discussion moves to one’s home then it sometimes becomes the role of the hostess to gently become the informal chair person. The other eleven plus mothers may often sit in the same seats – and refer to the same topics. After all many of us are creatures of habit. Bit by bit each of the mothers will work hard to become members of the `inner group’. Too much dissention and the miscreant will not be invited again! Like their children they will need to take it in turns. There is one emotion that does have the ability to bring a group of mothers together. The same emotion could be present in a family meeting convened to solve an eleven plus problem. The common topic uniting groups of mothers and whole families is one that could be foreign to some unfortunates. The emotion is called `empathy’. Empathy can unite families and less informal groups. 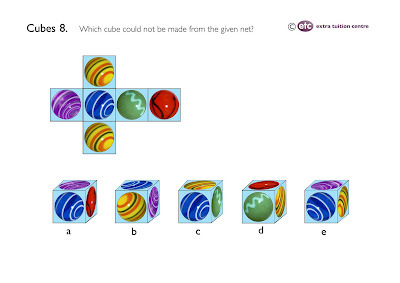 There is a topic in non verbal reasoning called cubes. The cubes have to rotate and spin to allow identification of a hitherto hidden side. Rotating and translating a cube is not a skill most of us have to use on a daily basis. When cubes questions have to be solved then family and friends have to unite. We need to feel sorry for those who can not see the solution. We need to be aware of a common urgency. The cubes secretary will take his or her natural place. On some occasions it may not be prudent to record the mother’s response! We should want eleven plus children to hold the right attitude towards the eleven plus. We hope that a bright and active eleven plus child with want to argue and discuss – and we certainly do not want a passive participant. We want the eleven plus child to be able to analyse questions and debate points. The last thing a parent would want is a `foggy’ eleven plus child. Equally few parents would possibly not want a `stroppy’ eleven plus child. To pass the eleven plus a child needs attitudes, skills and knowledge. To achieve all this some parents may have to be able to accept some form of challenge to their authority. Children are exposed every day of their lives to the explosion of knowledge. We see, for example, children accepting and revelling in the technology and the intimacy of our live on line lessons. There are nine and ten year old children can communicate effectively in a digital world. Our role in this new world is not stuffing the children full of facts and generalisations. We want the on line children to continue to have a positive attitude to learning and to develop a battery of investigative and inquiry skills. Do we want a `foggy’, `stroppy’ and `challenging’ child or a `positive’, `investigative’ and `inquiring’ child? Do you remember the story of Little Angie? Little Angie was walking with her mother down the high street. They passed a phone shop and Little Angie asked her mum for a new phone. Her mum asked her why she wanted a new phone and Little Angie explained that she wanted a pink phone. A little later they passed a mature and comprehensive digital shop. Little Angie asked for a new ipod. “But mum my ipod is old now. The new one is much better.” The pair walked on. Then Little Angie saw a new dress in a shop window. She had to have it. Nothing would deter her from nagging her mother into buying the latest outfit. Laden with parcels the pair passed a jeweller’s shop. There was a delightful vase in the window. Little Angie actually burst into tears when her mother said no. To avoid an escalating scene Little Annie had her beautiful orange jar. Little Annie then told her mother that she needed new eleven plus papers because she had completed the ones she already had. Her poor mother had to say no. Enough was enough. The family purse was bare. The family arrived home. Little Annie ran outside and turned the vase upside down. All the orange liquid ran out. Little Annie cried and cried – and wanted the vase restored to its original colour. Sobbing disconsolately she went to her desk and saw that the only eleven plus papers were scuffed and written on. The howls grew louder. Was the mother to mention the phone, the ipod, the vase, the dress and the papers? Was it mum’s fault or was it the fault of Little Angie? Should a third party have stepped in? Will Little Angie ever learn to look beyond the here and now? Thank you very much to Calum. Some years ago Calum gave me a book called: Kidstuff by Rogers. (ISBN 0900727780). There is one little saying in the book which may well appeal to all mothers – but perhaps especially to eleven plus mothers (or the mothers of eleven plus children). Should eleven plus children be offered incentives or should bright academic children study for the simple sake of working towards a competitive examination? A hospital in Norwich once ran a traditional staff suggestion scheme without much success. Someone thought of a novel idea – they used IVAN IDEA – with gifts and rewards. The scheme produced 2500 ideas – and one idea that emerged from the scheme was to use blue paper towels instead of white ones. This saved the hospital thousands of pounds a year as blue paper can be made from waste paper. If we asked our present eleven plus children it is likely that we could come up with thousands of ideas on how to make life in the eleven plus lane easier. Some will have experienced the bus lane on the M4. Someone then had an idea to take the bus lane away. As a person who has travelled occasionally on the M4 during morning rush hour, I applaud the decision to scrap the lane. Why not offer your child an incentive to see if he or she can come up with a good idea to make the perpetual scramble for the eleven plus easier. The results could be graded – some may be useful. The same question could be asked without the offering of an incentive. Most parents would have a pretty strong idea of the effectiveness of an `Eleven Plus Incentive Scheme’ or “IVAN IDEA 11+”. It would be interesting to understand how some eleven plus parents view their children. The China Syndrome gives an opinion on some parents and their relationships with their children. When parents want to help their children towards 11+ it is essential that they work together with the school’s teachers. Try not to counter anything, in front of your child, that you will hear from the teacher in case you confuse your child. You might even land up with your child feeling an element of divided loyalties. We know that most children working towards the eleven plus need guidance and encouragement. When you say: “You have done really well today, I'm very pleased with you,” you are setting your child up towards feeling positive about the examination. We all respond better to the carrot and stick. Read carefully any literature that you can find about the 11+. Remember, however, that the opinions expressed are often those of individuals and are not necessarily appropriate for your particular geographical area or the actual 11+ examination that your child is about to take. Even the opinion of experts can be misleading for your individual needs - or even worse - subject to misinterpretation. Attending a parents’ evening at school can be an invaluable way of gaining information. This is not the moment that you want to argue a point with the class teacher but it is a time to listen to what the teacher says. The teacher may be very busy on a parents’ evening but you can take the opportunity to make an appointment. If you do have a problem with your child's teacher then try to tackle it directly with the teacher. Naturally it is most important that you gain as many ideas and viewpoints from your family and friends, but the teacher in the classroom is in a position of responsibility and should be offered the respect that the position demands. The content of an 11+ syllabus is very hard to pin down and if you find it difficult to establish exactly what is involved then you are probably not alone. The 11+ authorities are under no obligation to give you information about the content of the examination. Naturally, however, there will be some information in the various documents that the authorities see fit to publish. Forums are often an invaluable source of additional information. Children with educational problems are faced with mountains to climb as soon as a start is made on formal eleven plus work. Some of these children may have arrived at school prepared for prescribed learning – but unready to cope with some of the developmental demands. Before a child, for example, is able to recite the alphabet many different educational blocks have to be in place. We presume that eleven plus children are intellectually ready to cope with the demands of the eleven plus – but what about what else has happened in their lives? Have they come from a very big class, does the school believe in the eleven plus or is everything all right at home? Of course parents hope and pray for an early diagnosis of any educational problems. They then hope that the school has the necessary resources to be able to offer their child the help that is needed. It is unfortunate for many children with problems that the eleven plus is still regarded as an examination that needs to be passed. There can be very few extenuating circumstances if a child has not reached the required levels. For some children the eleven plus journey is held quietly in the secrecy of the home. Some parents, we understand, prefer not to talk about the eleven plus to other member of the public. Other parents appear to choose to communicate in all manner of different ways about the progress their child is making towards the eleven plus. Forums, blogs, twitter, dinner parties, playground chats, meetings with teachers and formal discussions will all have played a part in the desire to listen, learn and communicate. Some children will meet up with other eleven plus candidates in lessons, courses, and even classes at school. Naturally there must be some discussion on the eleven plus. The attitude of parents to the examination may come up in discussions. Some parents may love to be a fly on the wall –while others will be eager not to know. What can parents say to their children about communicating with other children about the eleven plus? Listen to what you hear. You may learn something. Show an interest in what the others are studying – this may help you solve some of your problems. Have a laugh together about your parents – this is not being disloyal to the family – it is to do with building bonds with your fellow candidates. Keep in touch with your eleven plus friends about what is happening as the eleven plus grows closer. Explain that sometimes other children may have different points of view about the eleven plus – and that you should not make fun of them. The Olympics are growing ever closer. There are four jumping events – two horizontal and two vertical. Each competitor is allowed three jumps and the best of the three counts. The longest jump of the three by each competitor is the winner. Each competitor is allowed three attempts at the height. If he or she fails three times the competition is over. Three failures at any height means that the competitor has to drop out. Your child is allowed one attempt at a paper. Too many mistakes and the hope of a grammar school place is withdrawn. Just one chance - too many wrong answers and the Standardised Score will not be reached. There will be no Eleven Plus Pass. Stuck for time? Grammar school is no longer an option. The Eleven Plus is not a sport – but it is a competition. In the finals of the Olympics competitors are given more than one chance. In the final of the Eleven Plus there is only one chance. Olympic athletes do the hard work for glory and money. Eleven Plus children do the work for the chance of a place in a chosen grammar school.